When we left Korea, I shipped three years of my life home in boxes of all sizes. Big boxes of bedding, shoes, books I couldn’t part with, even bags of 쌈장 and 된장 (Korean bean pastes) I couldn’t foresee finding in Kentucky and living without. (Not having immediate access to Korean food has been a struggle for both of us already.) When we left Hoi An, a few days ago, we sent a box home of things we brought, or already bought, and didn’t need, and Andrew’s new suit. Not a problem! My dragon, on the other hand proved to be a big. big. problem. Counter 8 turned out to be the DHL counter. They told me I needed a box first. They sent me back to counter 7 for a box. Counter 7 shook his head at me. “Too big! Cannot send!” he barked. I shook my head to assure him I understood, and asked for a box. He eyed me suspiciously, but took my dragon, and put two printer boxes together to make a new bigger box, fit the dragon right in, and demanded the equivalent of $5.00 for his handiwork. Back at Counter 8, they shook their head and said it would be very expensive. Wrote down $211.00 on a piece of paper and said it would take 3-5 days. I asked for something slower (cheaper) and they sent me to Counter 6. Counter 6 sends me back to Counter 7. Counter 7 barks at me again, “Too big! No! Cannot send! Go Counter 8!” I go back, to Counter 8. 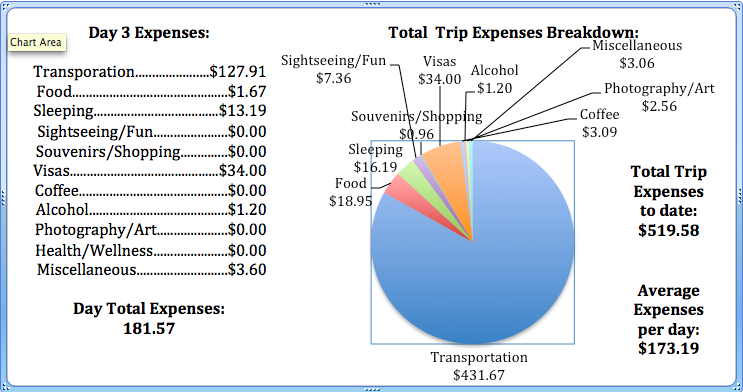 They look at the box again, then do some calculations again, and then they write $593.00 on the same piece of paper they wrote $211.00 on previously. I look at them like they must have made a mistake. I asked for something slower. They informed me they only did express shipping. I pointed to $211.00 and asked what happened. They pointed to $593.00 and waited for me to magically understand. I told them I could not pay $593.00 and plopped my box down next to Andrew, who was – throughout this whole ordeal- still sitting in the middle of the three counters writing out postcards. He gets up, takes the box to Counter 6. Gets sent to Counter 7, where the same postal clerk looks at me like I must be missing something in the head. “I’m sorry! Too big! Cannot send!” he tells Andrew. Andrew tries to explain how light it is and asks again why they can’t send it. Counter 7 ignores him. Andrew doesn’t budge. I try to hide, until I eventually see Andrew get sent to Counter 8. The girls at Counter 8 have disappeared. I convince Andrew that it’s not possible, and we take our dragon to the agency where we booked our bus tickets to Cambodia. The girls at the tour guide agency demand to know what is in the box. I say “Dragon!” and I do the dance. They shake their heads and say we have to talk to the bus driver, maybe the box is too big, and we cannot take it with us. I make the executive decision that I will wear the dragon head on the 5 hour bus ride if I have to. Andrew makes the executive decision to get a motorbike so we can pile as many boxes as we’d like on the back. We walk up to the bus drivers. There are at least five of them. They all look at me suspiciously until one asks what is in the box. “Dragon!” I said again, and again, I do the dance. “Ohhh…” and they respond in Vietnamese, and do the dance. “Yes!” I cry, relieve to see them smiling. One of them demands $10.00, and I say “No way!” and they laugh, repeated “No way!” to each other and put the dragon under the bus. “Maybe we should just take the dragon with us around the world.” I suggested to Andrew once we got on the bus. 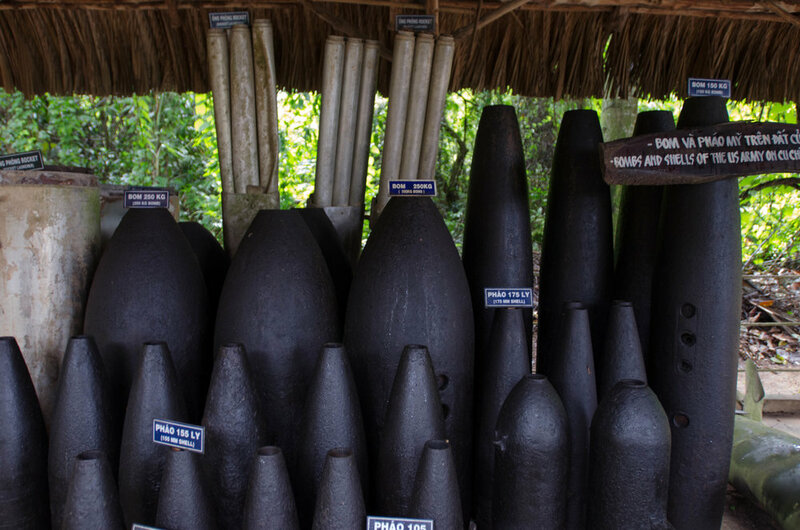 Just like Sapa, the Cu Chi Tunnels outside of Saigon, have become overrun with tourists, which totally took away from the experience. I told Andrew that afternoons in big groups like the one we were in make me appreciate not being part of a big tour group all of the time. The tunnels were made and used by the Viet Cong during the Vietnam War. Not only do the network of underground tunnels run around southern Vietnam, but they also provide a route to get to and from Cambodia as well. There aren’t any rides, parades, or princesses, but I feel like the tunnels have a Disneyland quality about them, if Disneyland were set in the middle of a jungle, with death traps, bomb craters, and an AK47 shooting range. Tourists get the opportunity to disappear in hidden entry points to the tunnels, take pictures with dressed up Viet Cong manequins, shoot guns, and walk through the tunnels. It’s educational, but a bit of a wonderland, and I wonder if in ten years if visitors will get to dress up in Viet Cong gear and enter the tunnels in an even more simulated experience. In true Vietnamese fashion, our bus stopped off at a handicrafts workshop and store for 30 minutes. I amused myself photographing a garage door instead of shopping. Halfway through our tour, it started pouring. Andrew made fun of me for packing a mini-umbrella. Guess who is making fun of who now? When we got back into Saigon, we immediately hopped into a cab to go to district 5 (doesn’t it sound like we’re in the Hunger Games?) to get my dragon. I handed my directions in Vietnamese over to the cab driver. He asked me something in Vietnamese. I responded with an apprehensive expression. Then he did the dragon dance. He pretended to have a dragon head on and wiggled back and forth in his seat a bit. I’m sure my face lit up, I shook my head up and down and said “Yes! A dragon!” and did the dance back to him. He dropped us off right outside a Chinese dragon shop ten minutes or so later. We thought we were going to a market, but we ended up on a street in Chinatown with three different shops full of dragons. We walked in and out of all three dragon shops, pricing them out, before we returned to the first shop and eyed three different dragons. I tried them on. I made Andrew try them on. And then I debated. I intended to get the smaller size, but they looked cheap, and not nearly as ornate. The biggest one was by far the prettiest and most well put together. But it was nearly triple the price. I hemmed. I hawed. I made Andrew put the dragon heads back on again. And then he asked which one I really wanted. I said the big one, but it was expensive, and I knew my mom would yell at me for getting it. He reminded me it was my birthday, and he hadn’t gotten me a present yet! It really wasn’t that expensive, but this way, I wouldn’t be the one in trouble with my mom for buying a dragon in Saigon in month 1 of 15 of our travels! Awesome! Not awesome: realizing we didn’t have any Vietnamese cash with us and we were in the middle of Chinatown. We walked around to three or four different atm machines. I told myself it was ok to not have a dragon, I didn’t NEED it… We wouldn’t have to worry about shipping… I could maybe find one in an American Chinatown… and then one magically spit money out at us and we were back in business! We dropped the dragon off at our hotel before going restaurant hopping for our last meal in Saigon. We do this somewhat often- we hop between restaurants, ordering one dish at each restaurant so we can get more of a variety of food/ambiance. The second restaurant we eyed said “Traditional Vietnamese Food” on the sign. I rolled my eyes. “We would never go to a traditional Korean restaurant in Seoul!” I told Andrew, as he stopped to look at the menu. I wouldn’t even cross the street, yet he kept eyeing it until a westerner walked out and told us “Oh it’s great! You should try it, really good food!” So we went in. Big. mistake. The restaurant was clean, but too clean (and too empty) to be a good Vietnamese joint. The food was ok… but not as good as what we had had already, and it was pricey! ($4.00 for fried rice, tofu and a beer! Crazy talk!) On our way out, the Spaniard was still there talking to the chef. 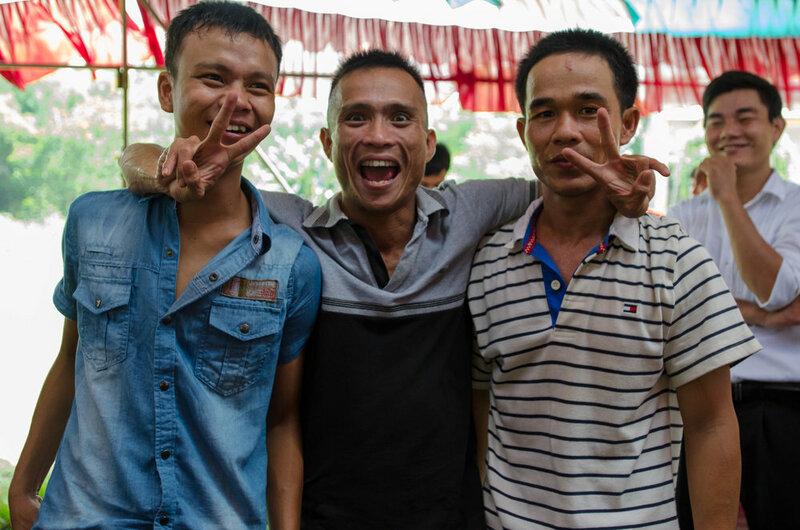 He told us he had just gotten into Saigon – from Spain – that afternoon. “Seriously, he’s been here for a day and we went in on his recommendation?! ?” I asked Andrew when we were outside. “Ohmigod, I know…” He responded and we pouted. 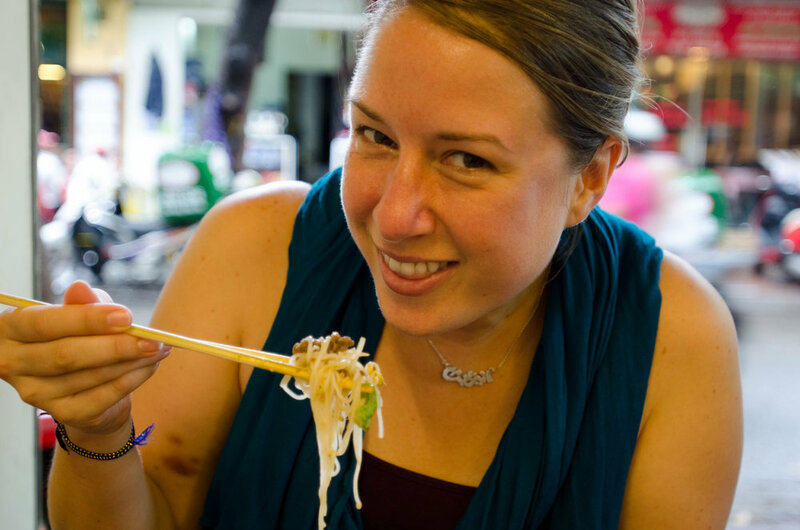 I eyed the Vietnamese group slurping up what looked like delicious bowls of fried noodles, sitting on little plastic stools surrounding a table full of sweaty beers, and declared that we would no longer eat at any traditional fill-in-the-blank cuisine restaurants anymore. Andrew agreed. At least his hotel pick in Saigon was stellar. That night, the manager sent up a little cake for my birthday, which we ate before I promptly danced around as a dragon. My birthday in Saigon was not what I expected it to be… not that any birthday is, really… But I wanted to go to the market, get a dragon, figured we may as well stop by the War Remnants Museum for an hour-ish for Andrew to see, and then go straight to a cafe a friend recommended and lounge for the rest of the afternoon. None of this really happened, except the museum, for an entirely too long of time on one’s birthday. I mean seriously, what was I thinking? First stop, Ben Thanh Market. I thought, surely I’d be able to find my dragon here! The market is pretty big, and last time I was there, tents and miscellaneous shops were set up on the outside of the market structure. We entered through the clothing section, Andrew (finally) settled on a pair of sunglasses, and we walked through, hoping to find a dragon. Me, more so than Andrew, of course. 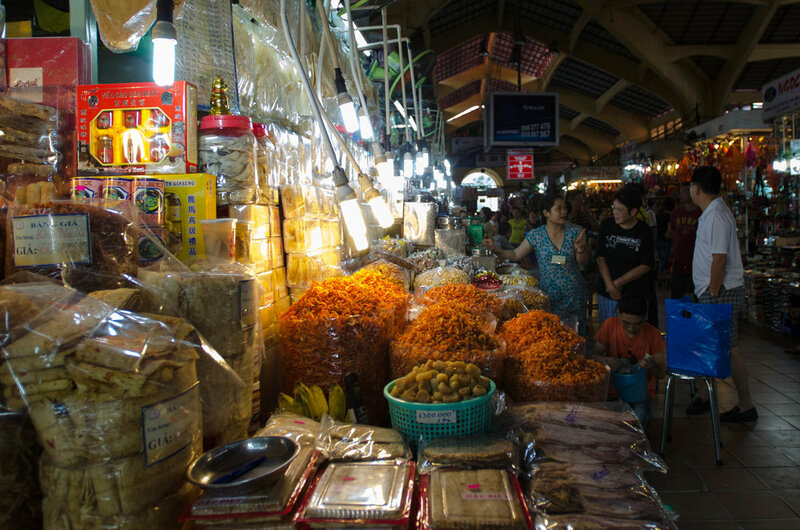 Through the fruit stands, coffee stands, noodle shops, and then we set foot in – what felt like a souvenir section. Unfortunately the only dragons that were offered were of the keychain variety. Not exactly what I had in mind. Disappointed, we made our way to The War Remnants Museum. I had already been there, but didn’t remember it taking very long (I think they’ve added a few sections or reorganized in the past four years). I also seemed to have blocked from my memory how horrible and awful it made me feel setting foot inside. American planes and tanks line the outside of the building, while Anti-American propaganda pretty much hangs on all of the walls inside of the building. “Well they won, they can write whatever they want to in their history books…” Andrew replied to one of my fits. “But that doesn’t make it right.” I retorted, longing for a happier birthday. 2. Why do people pose in front of airplanes, bombers, and tanks that wreaked such havoc during the war? I remember asking my mom to to take a picture of me in front of the Enola Gay at the Smithsonian when I was 13 years old or so. I think I was excited that I knew what it was more than anything else. But I remember being really confused, thinking “do you smile in front of a plane that dropped the first atomic bomb?” I went for the confused look and have since never had a picture taken of me in front of something similar. 3. Senator Bob Kerrey. Why is it that a senator (or fill in the blank government position here) can hold office after killing innocent women and children in a war (and according to the museum do a lot more really horrible things) but a senator (or was he a representative?) can’t tweet a picture of his package? I’m not condoning either. But don’t you find it a little fascinating that one is ok because it’s “patriotic” and the other is practically considered heinous just because it’s creepy? And it is creepy, I’m not standing up for the pervert tweeter, but at least his tweet didn’t murder anyone! After the museum, we stopped by the post office to mail a postcard to my favorite elementary school students, and then we tried to find the cafe Hans recommended to us. We talked about the Vietnam War nearly the entire time. Which I enjoy. I really enjoy talking about politics and history with Andrew, but maybe it’s not a good idea to do so when walking around for two hours (in what felt like circles) trying to find a restaurant at an address that did not match up. Lesson #7 learned from traveling around the world: Get exact directions, and confirmation of a cafe’s address/location before you go traipsing around to find it on your birthday. It’s just not worth the three hours of looking for, not finding it, and walking home. By the time dusk rolled around, we were forty minutes or so away from our hotel without a dragon, a clue where the cafe was, and any kind of “Yay it’s my birthday!” feeling. And I desperately wanted all of those things, which led to desperately wanting other things- like a hot shower, and clothes that weren’t from my backpack, a backpack I liked (rather than the one I have), and my girlfriends to celebrate my birthday with me… A “Happy Birthday!” on Facebook, or an email if I’m lucky is nice, but it’s just not the same, you know? Anyway- The list went on in my head, and I started to sniffle. Andrew stopped walking and gave me a hug and promised we’d find a place to sit down soon, which we did, and we even found a souvenir shop, that didn’t have a dragon, but gave me directions to where I could find one. It wasn’t an exciting day, to say the least. We woke up in Nha Trang after 12 hours or so on an overnight bus from Hoi An. I’ve heard mostly terrible things about Nha Trang (muggings namely, but the deaths of two former English Teachers in Korea didn’t help matters) so despite it having beautiful beaches, I didn’t want to stay. Also, I didn’t want to be on a bus for my birthday. As it turned out, neither bus (there were two) were all that bad. They were only about 1/3 full, and we were able to stretch out and play musical bus seats when we wanted to sit up or lay down. Patience is a virtue that I’m constantly improving upon while traveling. 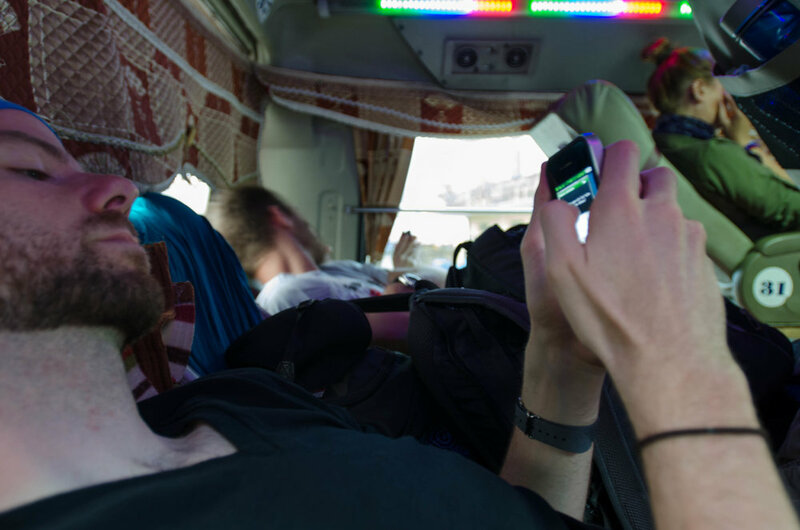 In the past, I didn’t remember the bus from Nha Trang to Saigon taking as long. Then I realized, the Vietnamese kid we picked up in the middle of nowhere, and then dropped off in the middle of nowhere probably had something to do with it. Annoyed, after being on a bus for nearly 23 hours at this point, I wanted to give the driver a piece of my mind, but it’s Vietnam. I don’t speak Vietnamese. He doesn’t speak English. What can you do? We camped out for a bit in the morning drinking coffee and blogging, I caved and sprung for the “Buddha is my Om Boy” t-shirt I had had my eye on since we first walked past, we shot some video for Andrew’s project (soon to come on BeCarefulYourHead.com!) and then we walked through the market. On our way to the market, we were asked at least a dozen times if we wanted to go for a boat ride. One captain tried to persuade us by informing us that it was “Happy Hour” as if that should make us climb aboard! I responded, “If I wanted to be on a boat, don’t you think I would be on one by now?” He stared back at me blankly and said “Happy Hour?” again. I was really fascinated by a wood carver who made faces out of what looked like tree roots. Clever. I watched outside, but didn’t go in for fear I would want to buy one (or three). Maybe next time… We strolled through the food stalls on our way back to our hotel to grab our bags for our overnight bus to Nha Trang and then heard some loud drumbeats coming from within the covered market building. We decided to investigate. What sounded like a militia drum, I expected an army, or something more… intimidating perhaps? Instead, we stumbled on of couple of boys pounding away at a drum and one magnificent dragon dancing in and out of the stalls. For what I’m assuming was for the Fall Harvest Holiday, known as chuseok in Korea, but known as what, in Vietnam, I’m not sure. The boys quickly surrounded us, and then asked for money when they were done. I put a few small Vietnamese bills in one of their hands and then the women of the market shooed them away. As if crashing a Vietnamese wedding wasn’t enough of a reason to love traveling, stumbling upon a dragon parade seemed to drive the point home. It quite possibly became my favorite part of the trip in that instant. And I knew, obviously, I needed my own dragon. We met Mr. Phong at the restaurant he works at in Hoi An. He seated us, made small talk, and then brought out two journals full of testimonials of visitors he had taken to his village. 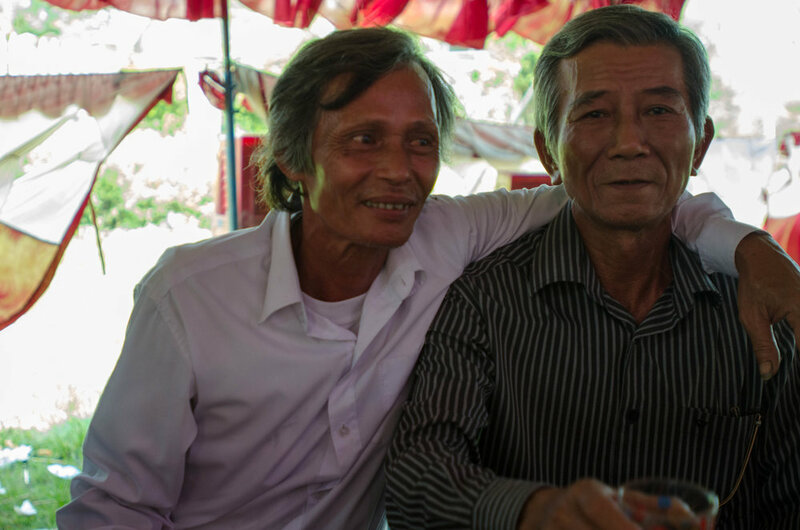 He asked if we had motorbikes and were interested in visiting his home to see “real Vietnamese life.” We told him we had plans, but would consider it. 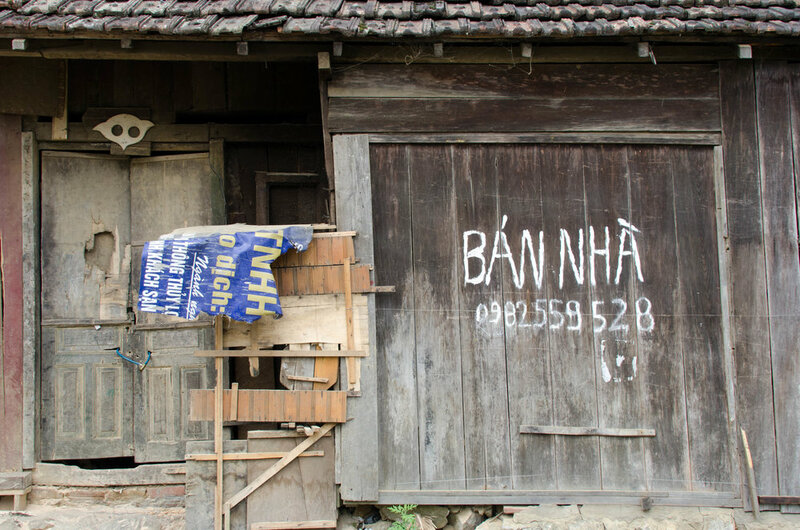 The testimonials in the book were very complimentary (as if someone would write something bad there) but the internet seemed to agree, and so we decided to spend half of the day with Mr. Phong in Thanh Quit, his village about thirty minutes outside of Hoi An via motorbike. He met us outside our hotel in the morning, and off we rode. When we arrived to his house, his wife came immediately outside to greet us. She didn’t speak any English, but her hands wrapped around mine in a way that you just know it doesn’t matter that you don’t speak the same language. 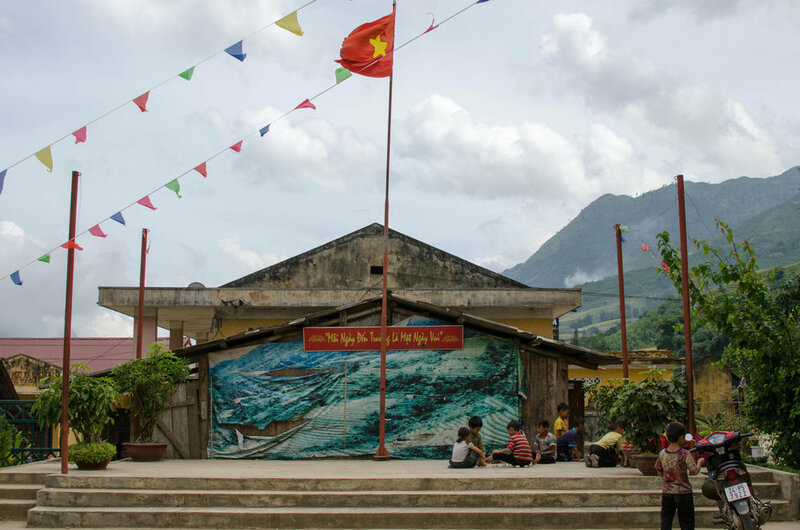 They welcomed us into their front entrance/what felt like a dining room, poured us some cold water, and Mr. Phong launched into lesson on the Vietnam War. It was fascinating, even though at times hard to understand. I felt a little like I was back in school again, which is a lovely feeling (for me at least) but a coffee had I woken up in time would have benefited my concentration greatly. Mr. Phong fought for the South in the war. His uncle and cousin fought for the North. Other family members fled to the States. The most fascinating part for me was that he said there is no ill-will between family members of different sides. I have a hard enough time with my family member’s conservative political views, and that’s without the VietCong involved! After we learned more about his “re-education” and what life was like farming under Communist rule, (I liked it when he made an example out of me and Andrew. I was the good farmer, who worked hard, took short water breaks, and yielded a good score at the end of the year. Andrew was the lazy farmer. He took really long water breaks, and didn’t get a high score, therefore didn’t get a good stipend at the end of the year.) He gave us a tour of his house. It was two stories, but there was only one room, and one balcony area for the house altar. Second floors are necessary because the first floor gets flooded every year. He pointed out water lines to prove it. 1. How much he makes from doing these tours on the side. 2. How much he greases others’ palms when he does these tours on the side. 3. 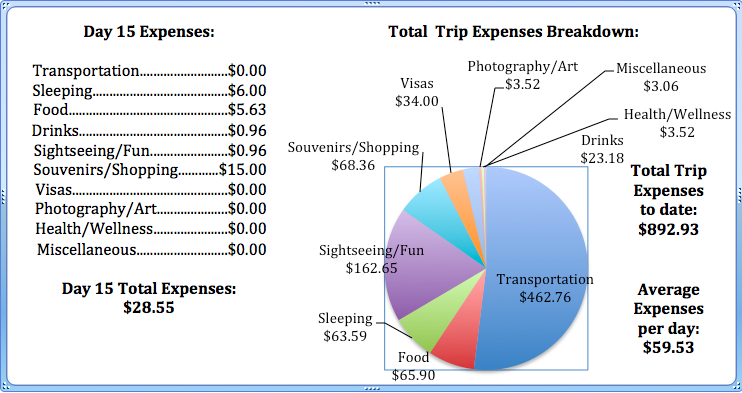 How much money he possibly hides away, because it didn’t seem like he was living in the lap of luxury, despite that he has to make far above the Vietnamese average by doing these tours on the side. He took us across the street where his neighbors run a “happy water” (rice wine) distillery. 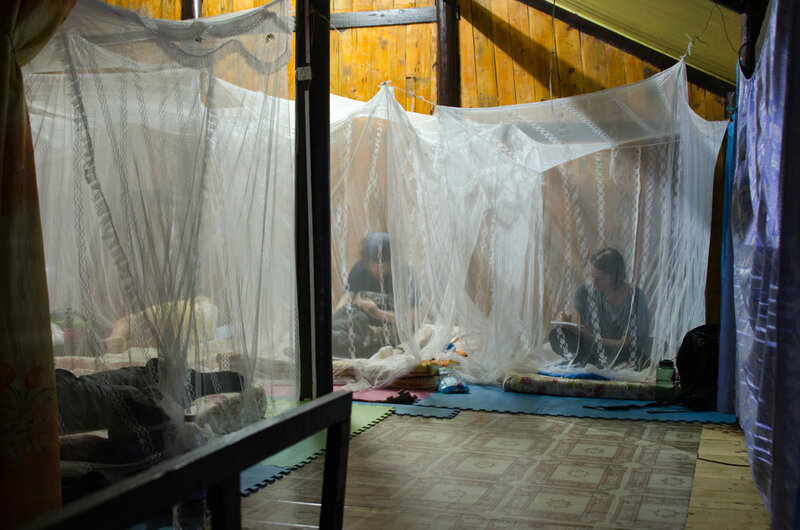 It was as if we were wrapped in a blanket of rice wine the air was so thick. Rice pulp lay out on a tarp, barrels were full of the happiest of water, and pigs around back slurped up excess water (I’m not exactly sure how that works and the pigs don’t get drunk noshing on the stuff) that was not needed for the wine. Mr. Phong dipped a pitcher into a barrel and the tiny taste I had was enough to put some hair on your chest! Wooooweee! On our way to the market, we crashed a funeral (which felt a little awkward) and once we were at the market, we learned how to properly chew an areca nut wrapped in a betel leaf. We had seen this a lot in Burma. In Vietnam however, we learned that only the women chew this, and only the men smoke. I thought it might be interesting to try, until the woman smiled, revealing a mouth full of black teeth. Hmm, nevermind! We walked through other houses, watched some women pull tobacco leaves off of the stem, peaked into a kindergarten, paid our respects to the monument that had names of those from the village who died in the war on it, and then… we crashed a wedding. It was… intense. Music was several decibals too high. Everyone was staring. Men were posing for pictures, asking me to dance, then asking me to marry them, then apologizing to Andrew. At first, I was handed a small loaf of bread on a stick, with a piece of gelatin on top. When the gelatin slipped off the stick (oh darn!) one gawker guest quickly replaced it so I was not to miss out on this culinary gift. (oh… darn…) We were invited to stay a bit longer to have a drink. “But just one drink!” another guest insisted. “You drink one drink! Only… maybe… ten minutes… not drunk like…” and he motioned to his friends. “Right, Of course! We will only have one drink, and then we’l go!” Andrew and I insisted. “Yes! Yes! One drink, and then…” he said again. “We’ll leave!” we assured him. We walked out of the wedding, thanking everyone, we may have agreed to see them again tomorrow, and then we looked at each other wondering what on earth had just happened. Back at Mr. Phong’s house, his wife cooked us this amazing meal, and then we climbed onto our motorbikes to head back to Hoi An. Back at Mr. Xe’s in the morning, Andrew was pleased with the linen shirt and got some more measurements done for a suit… So Andrew could Suit up! One of my favorite students at Eonju was (is still, I’m sure) obsessed with How I Met Your Mother. Any and all jokes and/or expressions Barney makes makes me think of you, Seungyoun! After Mr. Xe measured him, we were led down the street for a second measurement. Surrounded by boys on sewing machines, I amused myself by taking their picture. I played up being bored, waiting on Andrew, so they seemed amused when I began photographing and showing them the pictures (on the LCD screen) that I took. We biked it to the beach. We got harassed by more vendors. We ate more bahn mi. We ate more cao lau. And then I saw rompers outside of a tailor shop on our way home. (I’ve developed a little habit of calling wherever we may be sleeping that night “home.”) At only $15.00, I figured it was worth it to have for the trip and got my own measurements while Andrew played with the shop dog, Rabbit. First order of business in Hoi An: find a tailor. Second order of business in Hoi An: decide what you want to get made. If you have the money (and the room in your bags) this is super fun. But, I should probably mention I have an excellent seamstress for a mom among many other excellent seamstress aunts and cousins in my family. From poodle skirts for dance recitals to wedding gowns, my family has got it goin’ on. I’ve been a bit spoiled, and walking through Hoi An simply made me want to sew with my mom more than settle on a certain print/fabric and be able to strip down, try on right in the middle of sewing to make sure the fit was just right. 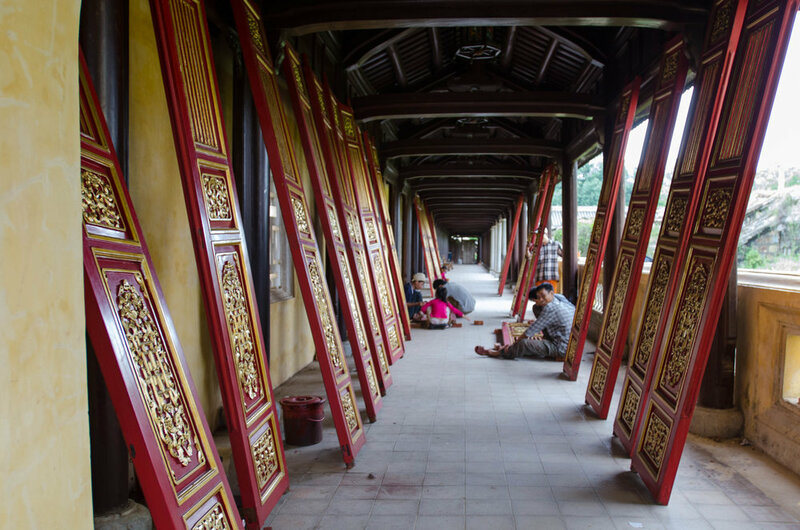 It’s a little bit more of a process in Hoi An. 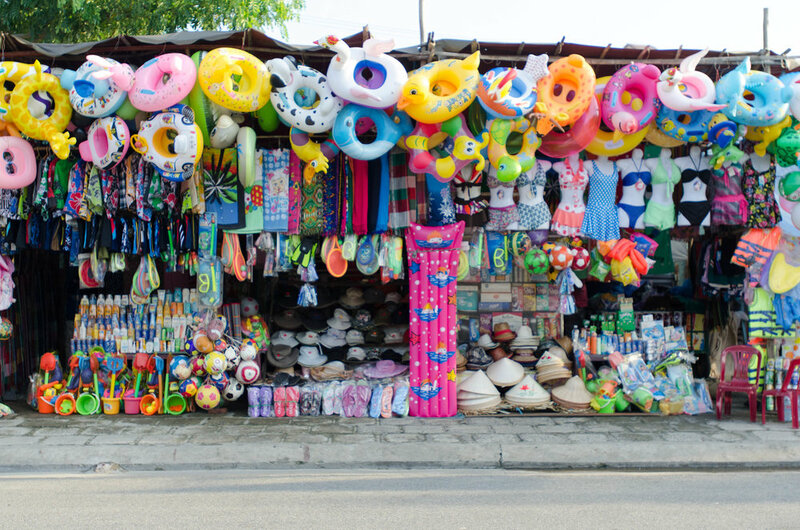 My advice is to get to Hoi An knowing exactly what you want. It’s easy to get railroaded into getting things made that you don’t really need (or maybe even want) once you get there. If you bring pictures and have an idea of what fabric you want, you’ll be more likely to leave with something worth your while (and money)! Nevertheless, it’s still fun and it’s definitely worth it for the boys who want nice suits made on the fly (and if you go to the right place; on the cheap). Finally (stomach issues be gone)! My first Vietnamese coffee of the trip. My favorite is the white coffee- with condensed, not fresh milk. Try it. It’s delicious. Andrew can’t exactly buy off the rack like I usually can. He gets nearly half (maybe more) of his wardrobe tailored to fit his slim/long fit. He was on a mission to get a summer suit made, so I tagged along to all of the shops, and sometimes pretended I was going to get something made as well. That is, until they told me that an above the knee A-line cotton dress (without lining!) would cost $75.00! No. way. ThuThuySilk, you are a rip-off. Andrew was less than impressed as well when the first few shops we stopped in all priced men’s dress shirts at $38.00. His research online suggested he could get just as good of quality for a lot lower. And then we went to Mr. Xe. Maxi dresses were only around $50.00 (which I thought was a good indicator of price) and men’s dress shirts were $18.00. Our aggressive salesgirl kept pushing for Andrew to buy a suit, but we decided to see how the shirt turned out first before he invested in a suit. Mr. Xe came out of another fitting, climbed up on a stool and went to work measuring Andrew. By this point, I was a little worn out from the “You come into my shop?” “You want a dress?” “Come in my shop!” and my ultimate favorite: “Buy something.” so I was intrigued when Mr. Xe (a man of little words) went to work measuring and then sent us on our way. I suppose he has a shop full of girls who are on the aggressive side for him, but he was a lovely break from it all. I’m also a huge fan of Project Runway and as Andrew was being meticulously measured, I imagined what it might be like if Mr. Xe was on the show. Day 13: Hello again, Hoi An! Our bus from Hue to Hoi An was a short 3 hours. Painless. Painful on the other hand was walking back and forth trying to figure out where we were, and where the hotels were. We’ve grown accustomed to the system of getting on a bus, and getting off at the bus driver’s restaurant, mini-stop, or hotel of choice. You know, the place where he gets a little kickback from the owners for bringing them business… We usually make it a point to walk across the street to buy our water and snacks, or in this latest case- Andrew stayed outside with our bags, while I checked out a room, before telling the girl that maybe we’d be back. It was dark, and the hotel seemed far from the city center. I suggested that we walk closer towards the center. 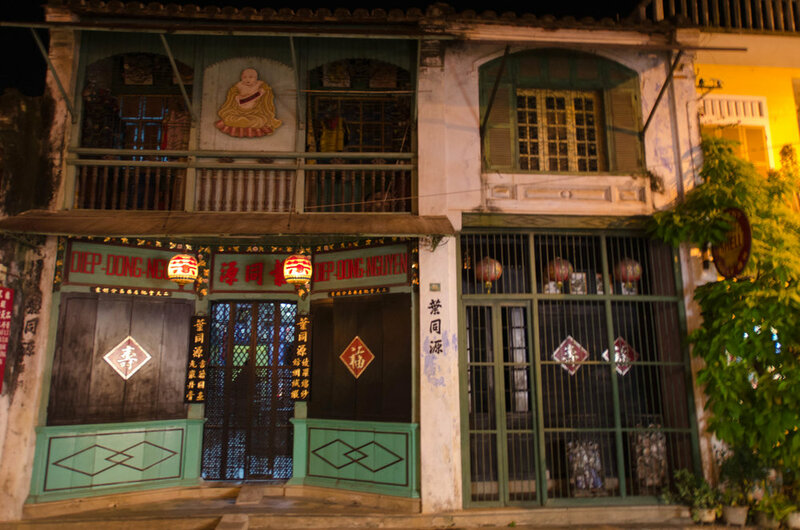 Hoi An is my favorite city in Vietnam. I had a really great time with friends I had made traveling through last time, and was excited to show Andrew around. me: Why would you spend an hour looking at places and not even pick one out? me: With my backpack? Seriously? No! I never want to “just walk around” with fifty extra pounds on my back! Never. No. Seriously?!? No, I never want to do that. A: … So do you still think I’m a great travel partner? And so we walked. I checked out another hotel, but wasn’t satisfied and told Andrew we could find a better one. Namely, one with a swimming pool, like the one I stayed at last time. And then… magically… we rounded the bend, and the next hotel was the very same one I stayed at four years ago! I hiked up to the fourth floor to check out a room, told the girl we’d take it, and flopped down on the bed. A: Aren’t you so glad I’m such a great travel partner, I mean, it’s a good thing I found this place. me: I said you weren’t. Remember? And you didn’t even find this place. A: No. You think I am. You said it in a moment of sincerity. I know you meant it. me: I’m getting another room. Obviously I didn’t. Although, at $12.00 a room, it wouldn’t have been the worst thing. We went for a swim and then walked through town. The amount of tailor shops has nearly tripled (or so it felt) but the relaxed town had not lost its charm. Huế was the imperial city of the Nguyen dynasty up until 1945. 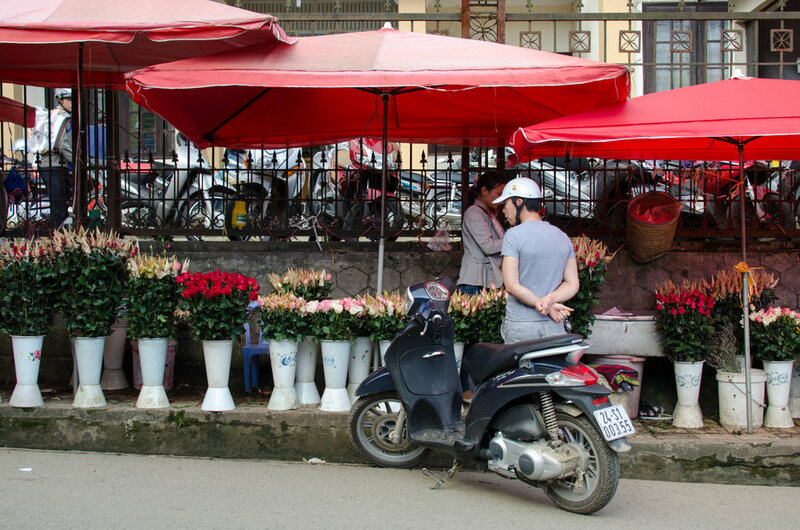 It’s a much smaller city than Hanoi, with not a whole lot going on in it outside of the historical monuments in and outside of the city limits. 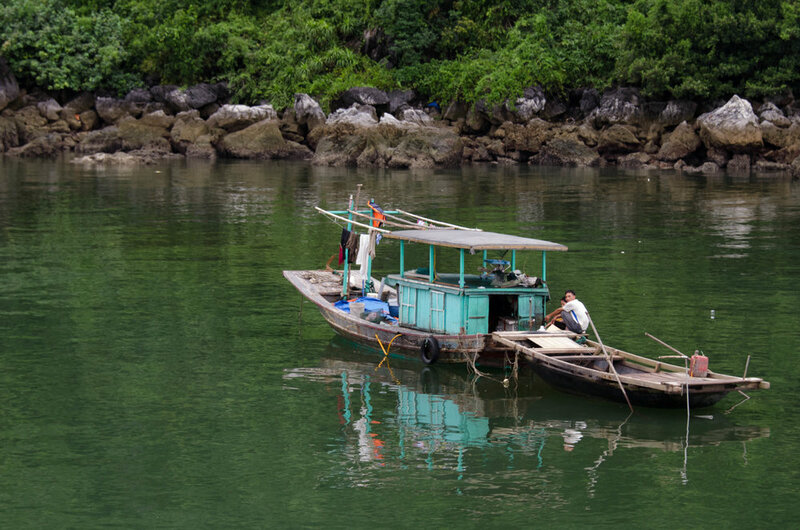 We crossed the Perfume River, walked to the Citadel, meandered through The Imperial City, and photographed a lively market before spending our first night in a 14 person hostel room. 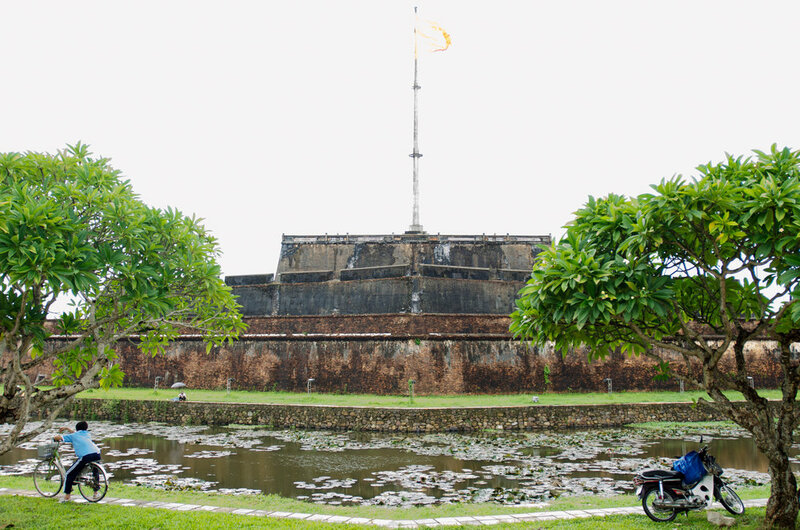 The Citadel is the structure that surrounds The Imperial City. It’s basically a wall. Andrew was frustrated we couldn’t get closer – in other words, that he couldn’t climb on and or into it. I wasn’t as enthusiastic. It was also a little bit hard for me to get excited about The Imperial City as well. (Sorry, Nguyen dynasty) I’m sure a lot of it has to do with how much damage was caused when the North seized the city during the war. It did seem as though more of The Imperial City was open to the public compared to my past visit. Right now, there is a large restoration project going on that was apparent as we walked through hallways filled with freshly painted red panels, and construction hummed in the background. It also seemed as though Korea is helping with this restoration project, evident by the large SAMSUNG sign over the large SAMSUNG tv with a brief explanation of the grounds brought to you by… SAMSUNG! We walked through the city towards the market area, passing by lots of dragons and food stalls that made for a colorful and entertaining walk. I loved the colors, especially when compared to the dull grey that dominated most of the cityscape of Hue. 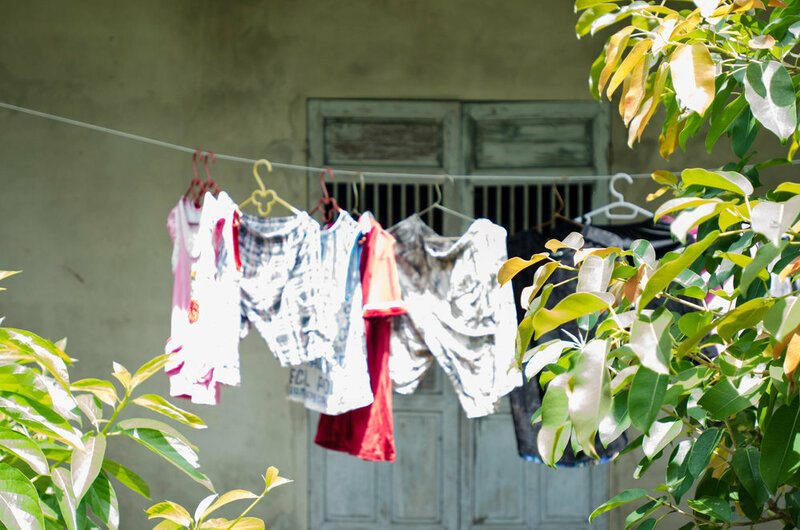 Vietnam tends to be bright and vibrant in the countryside, but rather dull (and dirty) in the cities. Obviously, this is true of any city/country comparison – the dragons and food stalls tended to brighten things up a bit. The market was busy. Busier it seemed than the markets of Korea, and of our favorite market experience in Burma. 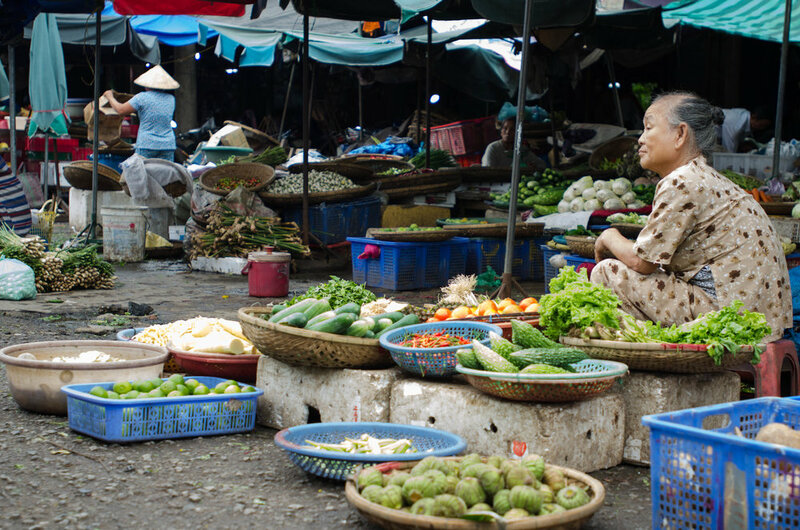 Vendors were one after the other, often several selling the same varieties of vegetables right next to each other. Motorbikes zipped through walkways and roadways alike, and it was as if every stall, or every vendor, or every different kind of good to be sold bled into the next item. Sometimes literally, as meat was chopped up and blood dripped down past baskets of fruit. It was chaotic. and it was unnerving to photograph. Usually, I feel right at home photographing a market (there are quite a lot in Seoul, and I visited many while working on Seoul Suburban), but here I was a little more timid than usual, and soaked up the chaos more than weaving in and out of vendors for photographs. 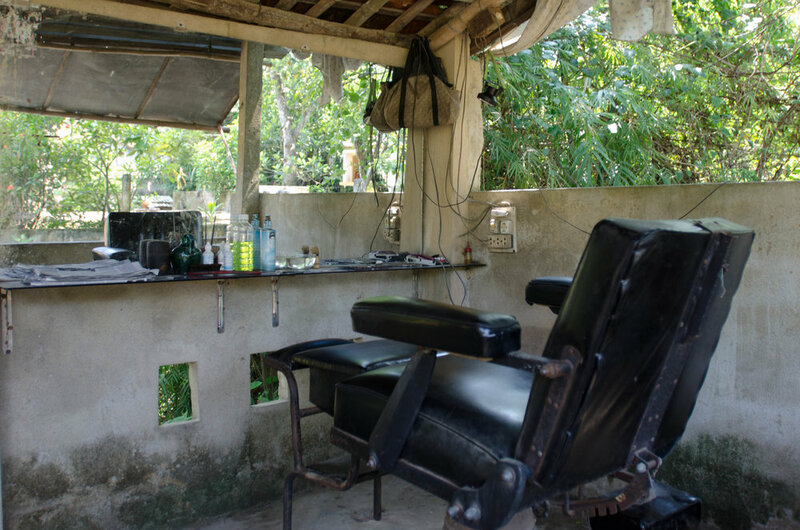 My favorite part of the market were the hair salons that lined the one end. That is something that was not seen in Korea and I loved the juxtaposition of the fruit, vegetable, meat vendors on the sidewalk while women sat in a salon getting their hair permed, colored, or cut within. Day 11: The day Alka Seltzer saved my life. As always, a Skype call with my Momma and her suggestion to take some Alka Seltzer cheered me right up, and made me feel lightyears better (but more on that later). Excited not to spend another afternoon sick in bed, we made our way to The Temple of Literature, a coffee shop, The Hanoi Hilton, and a little shopping before getting on another overnight bus, this time down to the ancient city of Hue. After meandering through the temple, we made our way across the city to check out The Hanoi Hilton. The Hanoi Hilton is what the American prisoners of war sarcastically called the Hỏa Lò Prison. It was first called Maison Centrale (a traditional name for “prison” in France) thus, used by French colonists for political prisoners. These origins explain the guillotine housed inside the prison, and statues of shackled Vietnamese prisoners that you see in the video. There are only two smaller rooms that divulge information about the Vietnam War prisoners of war and of course, they gloss over what really happened to them. Which I found annoying. Sure, it’s perfectly ok to represent the poor conditions of the Vietnamese who were housed there unjustly- but thanks so much for the pictures of Senator John McCain and President Clinton smiling in front of the prison several years after the war. Because I’m sure McCain was smiling the whole time he was kept as a POW. 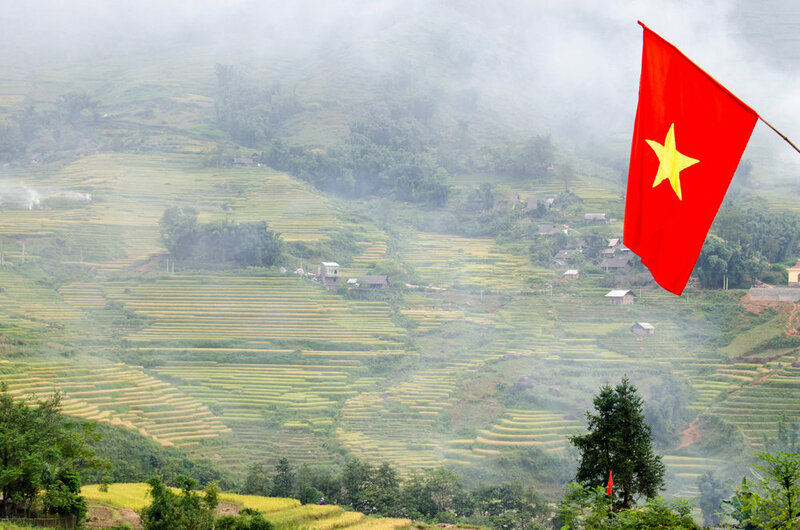 Good one, Vietnam. We hustled it back near our hostel, so I could (most importantly) go purchase the bag I couldn’t stop thinking about. (I know, I know… I have a problem.) We waited for some Banh Mi sandwiches, which turned out to be quite entertaining because the Banh Mi lady must have been operating without a permit… A siren started to wail, and someone barked information out of a speaker causing vendors to go into a state of panic, moving their makeshift operations into hiding. We watched her move her cabinets off of the corner down the street, then walk back out to check for signs of trouble, before moving her cabinets back to the corner to resume business. Then we got our sandwiches and waited for the bus. Of course, when we were on time (early, even!) for the bus, we had to wait 40 minutes or so before a man led us to a taxi that would take us to the bus, that was not even there when we arrived. Of course. Then, once the bus did arrive, we had to wait another 40 minutes on board, before it left. And THEN we realized our two seats/beds were next to a very (VERY) smelly bathroom. Which had a door that seemed to be too difficult for every Vietnamese man (who had to pee at least three times each before the bus left) to latch closed. So the door to the smelly bathroom would randomly swing open sending a strong waft of urine out over the six or so settled into seats on the back of the bus. Andrew being the closest, would have to reach over and shut the door every time. I’ve since decided urine is my least favorite smell, and after this bus ride swore I could pick up the scent EVERYWHERE. This led to a very heated (not really at all) between Andrew and myself. One that I will present to you: Would you rather: sleep next to a smelly bathroom on your sleeper bus OR not have a bathroom on the bus? After being sick on the two previous buses, I quickly decided I’d rather have the bathroom. Andrew (not yet sick at all) having had to close the bathroom door repeatedly throughout our 12 hour overnight bus, quickly decided he’d rather not have the bathroom. I woke up, and as I limped around the home-stay house, I confirmed that breaking in a pair of barefoot running shoes (that I thought would also make great wet trekking shoes) was the worst idea ever. I scraped the last of my Tiger Balm out of the jar and gently massaged it into my calves while we waited for breakfast. Our itinerary said we’d enjoy breakfast with our host family “after sunrise” and I thanked the Sapa stars their definition of sunrise ended at 9:30 AM. We were served, but didn’t eat with our host family (the family we still weren’t exactly certain who they were) and then we took off through terraces, bamboo forests, Giang Ta Chai village, a waterfall, and a suspension bridge. This day of trekking was my favorite. I still wasn’t feeling so hot, but the trekking through terraces and jumping over streams, and sitting with my feet in the water (Genius idea, Tony and Raquel!) felt the most like what I had enjoyed four years ago. It was a little muddy, a little exhausting, and reminded me of being ten and going out exploring in the woods behind my childhood home. 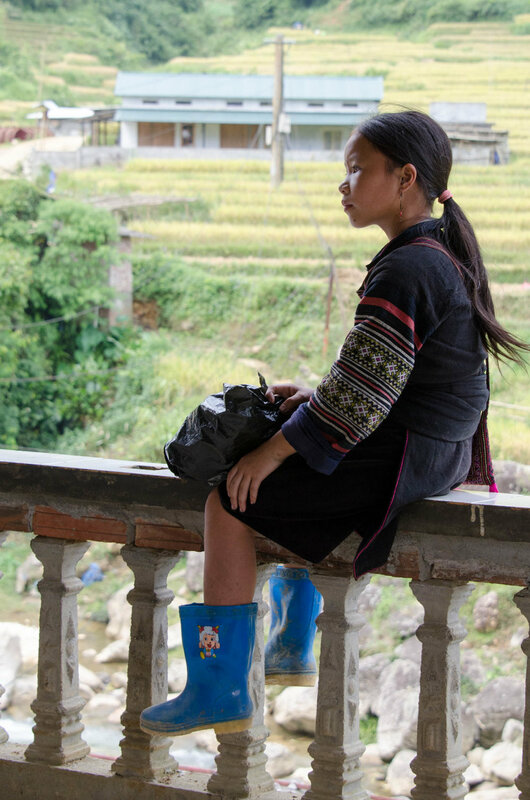 After lunch, we were picked up by a bus pumping some electronic dance beats and headed back to Sapa’s city center for showers, and last minute minority tribe wears. This got me in trouble. I saw a bag our first day in Cat Cat, but was feeling too badly to bargain it down to a reasonable price. I didn’t even stop to ask how much it was, just looked long enough to know it was just different enough from all of the other bags that I liked it a lot. Because I didn’t get it our first day, I was on a mission to find one similar on our last day. This didn’t happen. 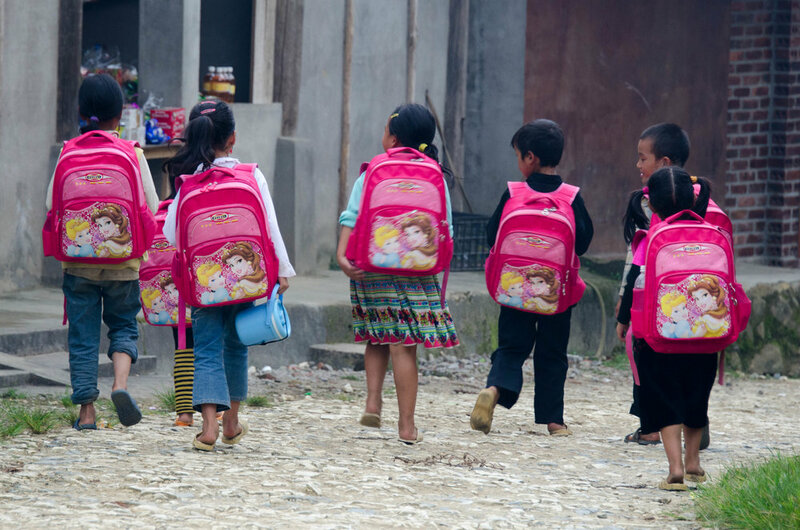 My next (not so) brilliant idea was to get another style (with the embroidery and colors I wanted) and take it to a tailor in Hoi An and have them turn it into the style of bag I wanted. Perfect? Right? Until I worried that maybe I didn’t have enough material for the style of bag I liked, and continued with (not so) brilliant ideas to buy a pillowcase (with the embroidery and colors I wanted) and even a belt (with the embroidery and colors I wanted) to ensure that I would have enough fabric for a bag. I spent $12.00 on this mess and later found a different bag entirely (of better quality for $15.00) I simply HAD to have in Hanoi. GAH! 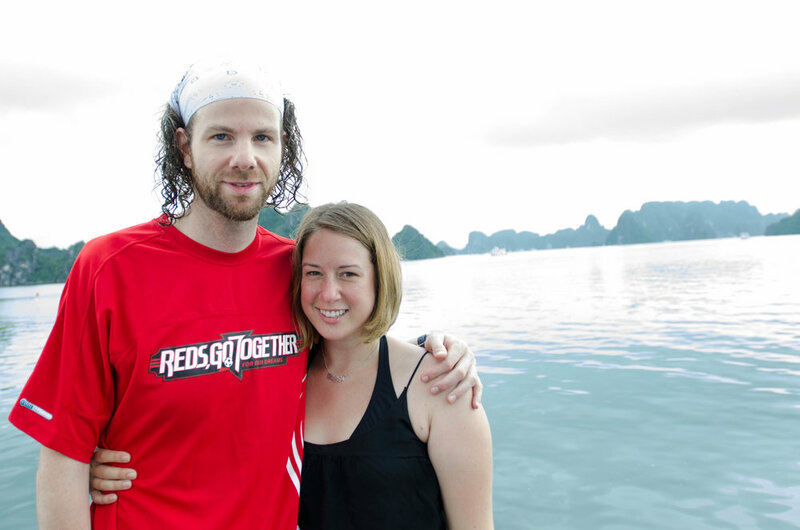 Lesson #5 learned from traveling around the world: Seriously. Don’t buy it unless it’s exactly what you want. Seriously. You’ll find another bag you love soon, I promise. After I spent too much on things I wasn’t going to want in the end, we got some Tiger Balm, showers, dinner, and hopped on the shuttle bus to catch our overnight bus back to Hanoi. Our bus driver hit a motorcyclist. We waited on the bus uneasily as we watched the poor driver try to call for help while not moving in the middle of the road, our driver busy picking up pieces of the bus that broke off upon contact. Fifteen minutes or so later, the motorcyclist got up (or more accurately, he was pulled to his feet by our bus driver) everyone cleared out of the intersection, we waited a bit longer, and then we were on the road again. On average, something like 30 people die daily in traffic related accidents in Vietnam. Not halfway through our trip here, it’s easy to see why. As if that wasn’t enough fun for one bus ride, I started feeling poorly again. Mostly, I think due to the anxiety of being on a bus with a crazy driver and 11 more hours to go. I was relieved when we pulled into a rest stop, hoping a trip to the bathroom would help. It didn’t. The “bathroom” consisted of a concrete wall separating the men from the women. A trough sat a little deeper closer to the wall, behind a row of bricks that were lined up for women to stand on as they (we) squat down to take care of business. side by side. Modesty is simply something you have to forget about in situations such as these. At least I wasn’t wearing a romper (without a bra) so I wasn’t completely vulnerable. (When attempting to poop in public, it’s better not to be naked.) I gritted my teeth, nodded to the Vietnamese woman next to me, and marched up to the bricks and squatted. Like a boss. Only not really, because of the two numbers that I needed to take care of to make my stomach feel better, I simply couldn’t attend to both with an audience. I climbed back on the bus and immediately into a fetal position for the remaining six or so hours before again, sprinting to a bathroom while Andrew checked us into a room in Hanoi. I assured Andrew I would be ok and I didn’t need to spend another afternoon in bed, “I mean, the worst that can happen is I have to poop in a rice paddy. or my pants. I guess pooping my pants would be worse.” Andrew seemed to think I would make it to a rice paddy. And off we went. First, to ask our adorable guide, May, if I could stop at a pharmacy at the beginning of our 15K trek. And then, down the mountain. 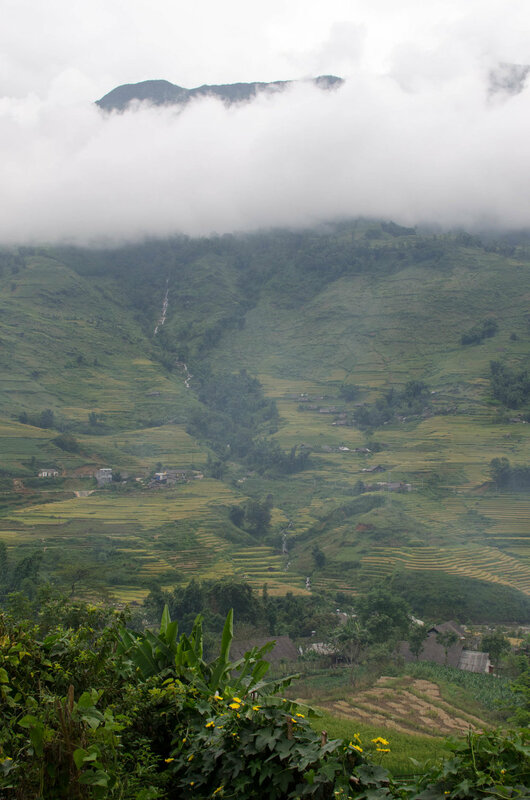 With about thirty other tourists, and what felt like an equivalent of Black Hmong women, we began our trek down into the valleys, walking between rice paddies, and through the villages. The scenery was beautiful, my stomach was (for the most part) staying in check, and the women gamely answered my questions about life in a Black Hmong Tribe, even when I asked bluntly “So, do you like being married?” They gaped at me, as if I were the first one to ever ask. Maybe I was, but from what they answered “liking” or “disliking” being married isn’t really an option. They just are. married. Andrew accuses me of having a certain, shall we say opinionated tone when I discuss women’s roles in different cultures. He’s right. I do. But, I’m working on it. I’m going for that “Oh, what’s that like? Women not being equal in your culture?” curious tone instead of my “Oh no you didn’t just tell me women are lower than men!” sassy tone that usually comes across. It’s hard for me not to get a little feministy when I’m speaking to a Muslim tour guide in South East Asia’s largest mosque and he tells me “Women don’t ask such questions!” or in this case, when I’m chatting with a 17 year old girl who is married, 5 months pregnant with her first child, and leading a 15 K trek. In my head I thought back to when I was 17 and what I was doing. Graduating high-school and moving away to go to college. How fortunate I was, right? But then I gently remind myself that her life is different than mine, her culture is different than mine, and I should not judge. And when I do judge anyway, I try to re-channel the judging into gratefulness. It makes me really glad I’m an American girl (although we do have a long way to go) and really glad I’m no longer an employee of a South Korean company (school). So, I chatted with May, our tour guide, about life. She said she enjoyed answering questions much more than leading a tour with people who didn’t talk. It gives her a chance to practice her English, learn new words, and likewise learn about different cultures. She was (is) awesome, and it was super interesting to chat with her. I learned that girls typically marry between ages 15-20. While their parents sometimes arrange their marriages, they are also allowed (in some instances) to say “no” and she readily acknowledged that women do much more work than men. Men’s duties revolve around the farming and only the farming. 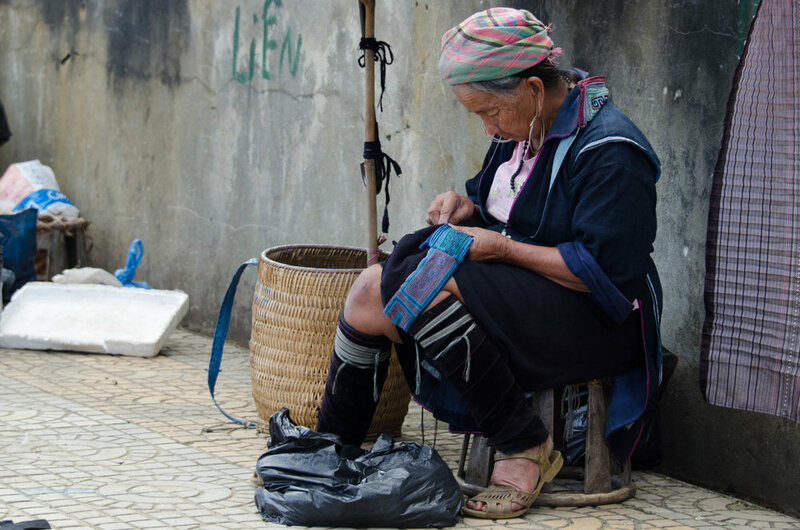 Women’s duties sometimes include farming, childcare, cooking, cleaning, and even selling goods to tourists or leading tours around Sapa. May also divulged that she doesn’t like “happy water” as it hurts her head the next day. 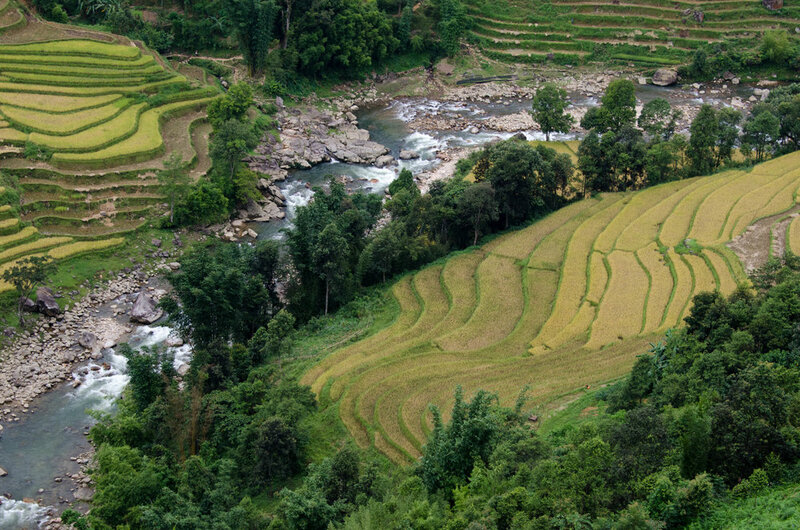 “Happy Water” is what everyone in or around Sapa called rice wine. Think of it as bootlegged soju, if you will. Made in the homes, a Kiwi living in Sapa told us there’s no way to know the exact proof of the liquor. 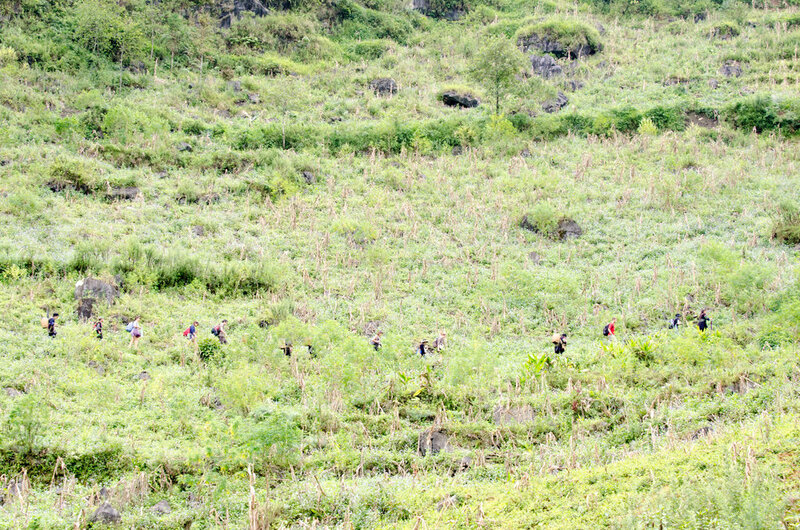 Throughout our chat, as we descended the mountain, Black Hmong women walked with and around us, helping us cross streams, making straw animals for us, and generally asking us the same three questions over and over and over again. 1. What’s your name? or Where you from? Obviously I fell into the old maid category. Almost 30 and unmarried. (Oh the shame!) “But you are from a different culture!” The sweet 17 year old pregnant one responded. I was struck by her open-mindedness after five years of being asked “When are you getting married?” in Korea. As we sat down to eat lunch, we were surrounded. The same sweet Black Hmong women turned into aggressive vendors pulling miscellaneous handmade wares out of their bags. It was frustrating, yet heartbreaking at the same time, especially when their children would come out of the woodwork trying to sell what their mothers undoubtedly shoved in their hands, pushing them towards us. It also became quite the bonding experience for everyone on the tour. We traded stories with the South African/Portugese couple, the French couple, and the Brit who was chopstick challenged. After lunch, we walked first to a school in the village, and then just a few kilometers more to the village where our home-stay was located. With a few hours of free time, we entertained ourselves by chasing down missing shoes the home-stay dog would steal, and giving some curious children some of our trail mix. They weren’t exactly expecting the “soy wasabi” flavored almonds, but then greedily stole and practically licked the inside of the bag. Later, these same ruffians surrounded us on a rice paddy wall and flung dirt on us until we fled for the safety of our cameras and clothing that we had to wear the next day. 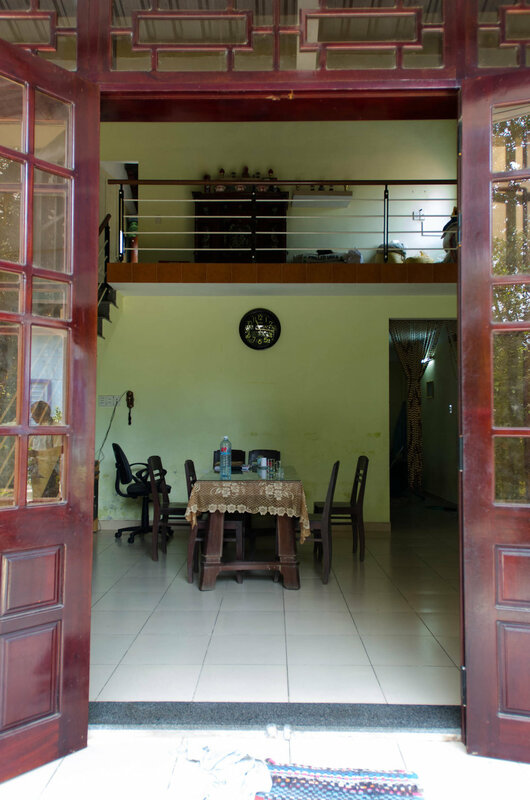 Now, sorry to compare, yet again, but four years ago the home-stay was with a family of three generations. The grandmother sorted seeds, while the mother made dinner, while the two Aussies and myself played with the children. Today’s home-stay experience felt more like a hostel conveniently located in the loft of a barn. We weren’t entirely sure who lived in the home, who was visiting, who was leading tours, but the food was good, even if Michael (the Brit) had an entertainingly difficult time eating with chopsticks. And we all fell into fits of laughter when he made the comment about eating “with sticks” as we took note of the rice scattered around his bowl on the table. The “happy water” a bit too strong for the majority of us, we took turns slinking off to the loft to sleep on dirty (mine was quite smelly) mattresses. Lesson #3 learned from traveling around the world: Maybe it’s not such a good idea to buy and wear barefoot shoes for the first time when going on a 15K trek. Oh for the love of calf muscles! 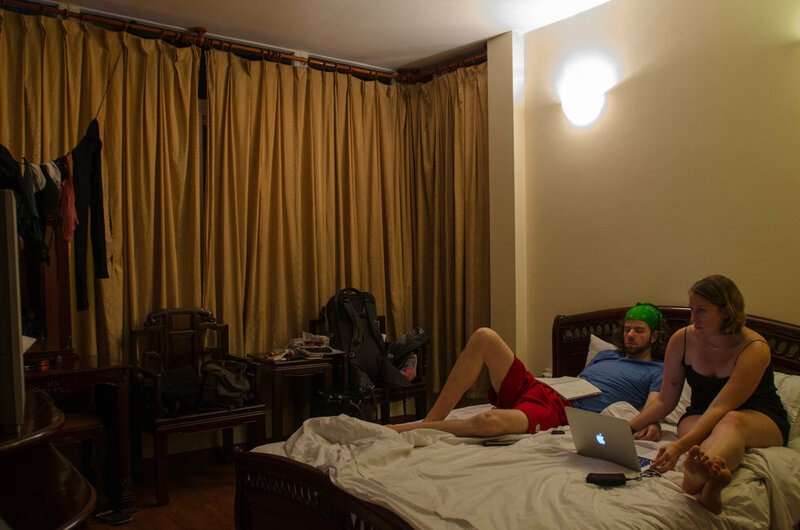 Lesson #4 learned from traveling around the world: Don’t pick the mattress closest to the stairs after a 15K trek. The one in the back, the furthest one away is bound to be less used, therefore, less smelly. 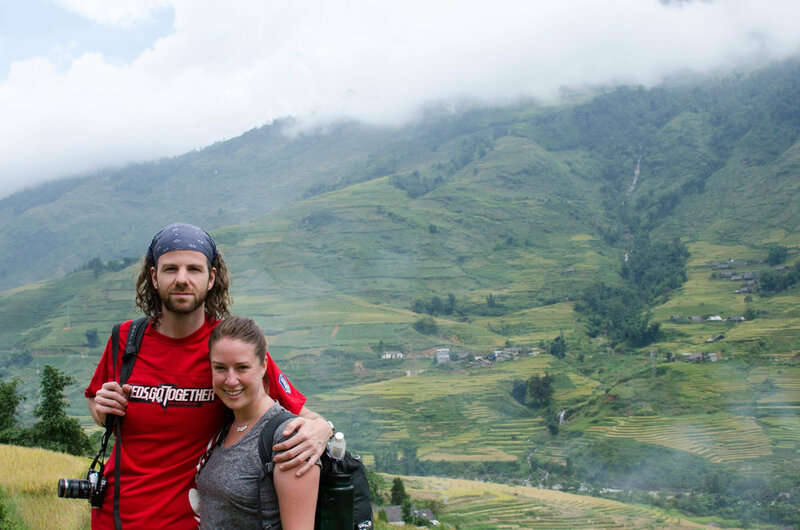 Four years ago, I decided on a whim in Hanoi to tag along with two sweet Aussie boys to trek through Sapa for two days, and one night. It was the muddiest, messiest, most fabulous part of my two month solo stint through S.E. Asia. I’ve been ecstatic about going back, and sharing what I expected to be another wonderful experience with Andrew. That is, until we got off the bus and I had to sprint (er, walk quickly enough to make sure I was first, yet slow enough not to alarm the front desk at the hotel) to the bathroom. Of course I got sick in Sapa. I was sick, but stubborn enough to attempt the 6K trek to Cat Cat Village. I survived half of the 6K trek. The down-the-mountain part of the trek, even though I was rather weak in the knees, suffering from the cold sweats, and requesting Andrew either hold my hand to help keep my balance or walk in front of me in case I fainted. Which, at the time, seemed likely. In short, I was a mess. Once we started ascending the mountain, my body shut down, and I caved. I wimped out. I gave up. I climbed on the back of a motorbike up the hill and promptly crawled into my hotel bed where I lay for the next 4 hours. When I woke up, in need of some fresh mountain air, Andrew and I walked through town, the market, and the town square before trying to convince my body that a bowl of chicken pho was the same as a bowl of Campbell’s chicken noodle soup. It didn’t work. But the ice-cream cone Andrew tracked down tasted good, even if it didn’t cure my stomach bug. Lesson #2 learned from traveling around the world: Don’t assume the meds you need are in your daypack without checking. Otherwise you’ll end up with an abundance of Claritin when what you really need is the Imodium you left in your bigger backpack. In a different city. While the majority of “The Party Boat” was recovering from the previous night, I snuck Andrew up to the roof to do some double pull-backs and a shim sham shimmy. Hey TapKun, (my wonderful tap studio in Seoul, South Korea) this is the first of many tap dances around the world just for you! 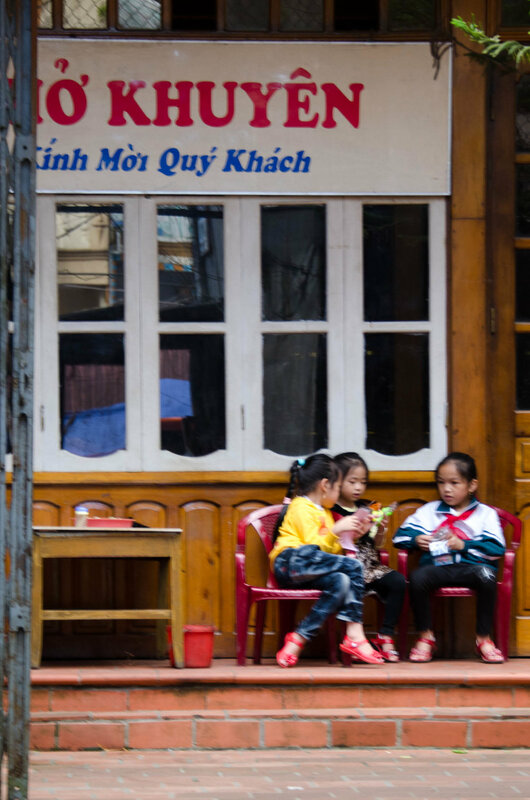 We kyaked in the rain, we learned how to make spring rolls, hustled it back to Hanoi, and Andrew and I had our first kerfuffle in the midst of the hour we had in Hanoi between one bus from Halong Bay, and another bus heading to Sapa. Other backpackers (I kinda detest this title I have assumed I should add. I mean, just because I have a backpack- one that I’m not satisfied with, I should add- but will save it for another blog post entirely- doesn’t mean that I’m a backpacker.) Anyway. 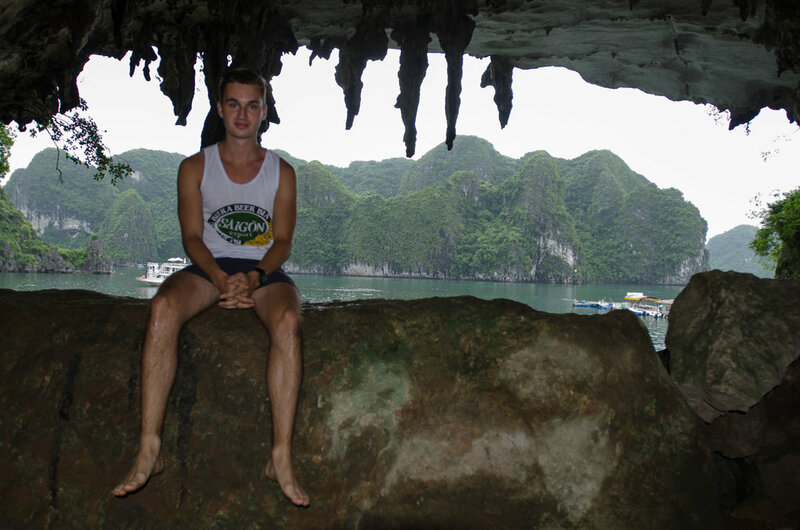 Other backpackers were a little annoyed at the timing of different Halong Bay activities. Kayaking being one of them. There simply wasn’t enough time they all complained. And Andrew and I found ourselves in the same kayak. (Ha. Get it? Same boat? Same Kayak!) I loved our guide, Coung, and would like to believe that our kayaking was cut short because we were, after all, getting rained upon. It still made for some pretty pictures though, raindrops in the Bay and all, don’t you think? I find it impossible not to add that I was the only one bold enough to take my camera kayaking. I know, I do pretty stupid things with my camera, and I don’t treat my lenses nearly as well as I should, but hey, at least I was able to take all of these fun pictures of everyone kayaking AND exploring this random cave in the middle of the Bay, right? After they brief kayaking excursion, we were granted an hour to clean up before our “cooking class” where Coung taught us how to make spring rolls. We all took turns making a couple of spring rolls, and then we sat. while it rained. and we waited for lunch. Which I should have skipped, because I’m pretty sure the chicken is what upset my stomach starting on the bus ride back to Hanoi. 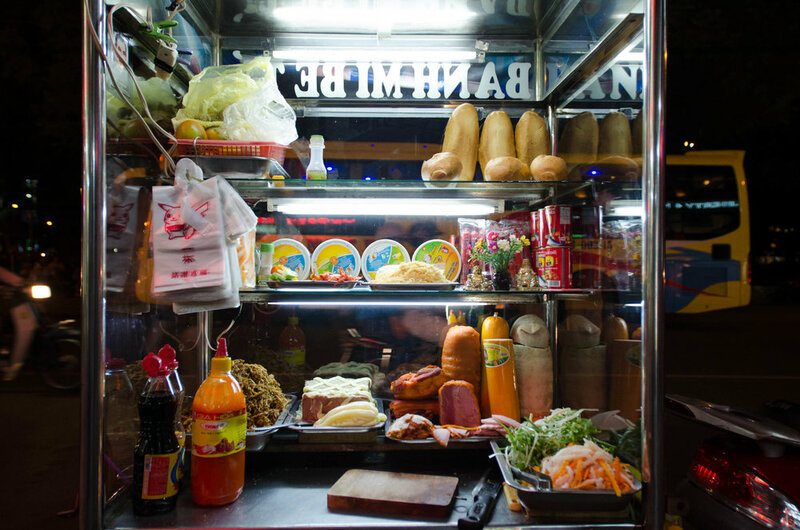 Once we got back to Hanoi, we had about an hour to re-pack our overnight bag, get something to eat, and get ready for our overnight bus to Sapa. Which would have gone smoothly, had I not started feeling badly, and had Andrew and I communicated in a more effective manner. Only, we didn’t communicate effectively at all. I said “crackers.” He heard “water” and went in search of dinner while I waited at the tour agency with an angry Vietnamese man huffing at me, hand gesturing to me, asking without English where my travel partner was. I sighed back, paced, and tried not to think about bathroom related activities and/or the fact that our bus was supposed to leave 20 minutes ago, unbeknownst to Andrew- and he was no where to be found. By the time he did show up, we were a solid 30 minutes late, and what I would find out to be an over-priced sandwich poorer all because Andrew thought I was hungry, when in fact, I had quite the upset stomach, was yelled at in Vietnamese, and thought we were going to miss our bus to Sapa. And then in his opinion, we “agreed to disagree” while I rolled my eyes and said “I said CRACKERS! I already had WATER!” as I held up my full Nalgene bottle like he should have known better. 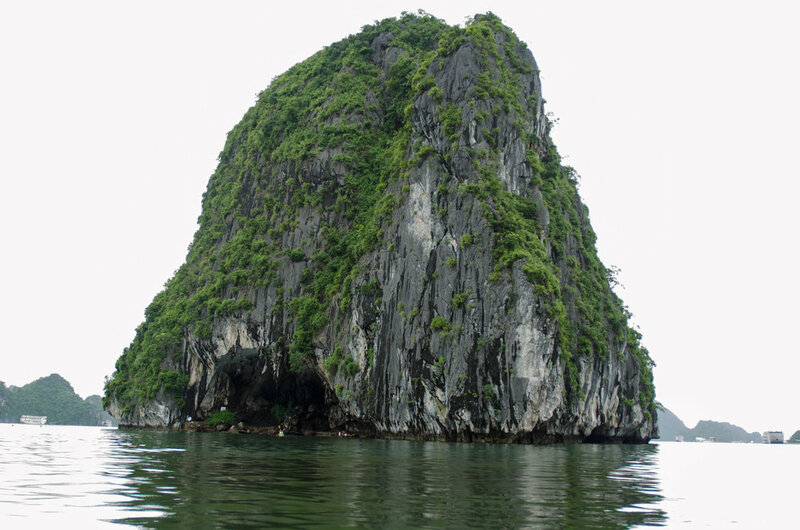 Halong Bay is a UNESCO World Heritage Site located about three hours from Hanoi, in Northern Vietnam. It’s gorgeous, and overrun with tour boats and tourists, but worth a visit. 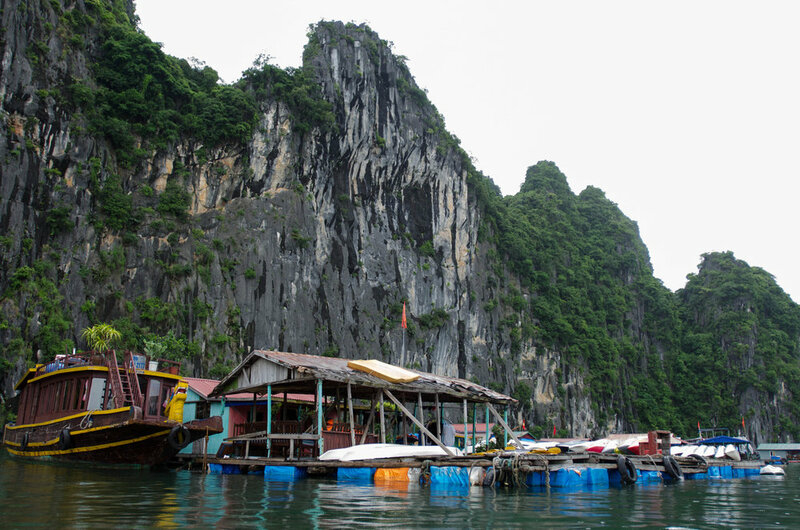 The Bay is full of limestone karsts (huge rock formations), caves, and fishermen villages and boats. As most tourists do, we booked a 2 day, 1 night boat trip through the Bay. Our boat held a group of 12 Vietnamese bankers on vacation, and an assortment of Westerners: an older German gentleman who currently resides in Chiang Mai, a Chilean couple in between a move from Spain back to Chile, two younger Brits traveling around, and Andrew and myself. 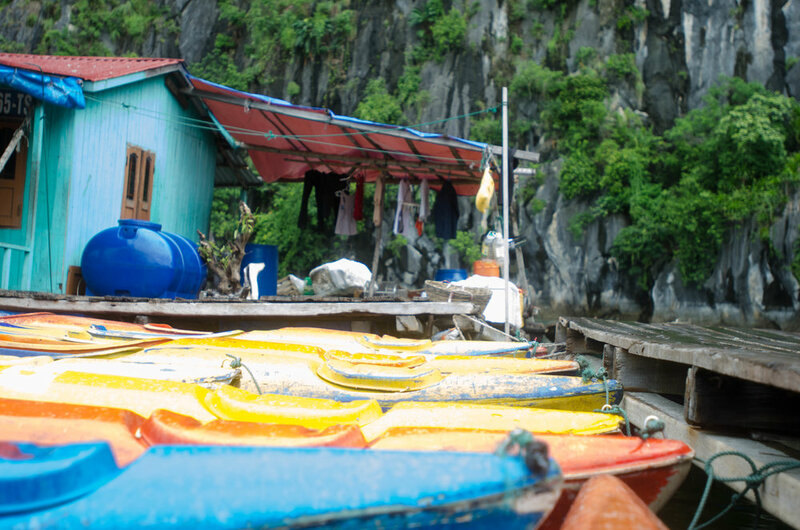 Many of the fisherman live in little fishing villages right on the water inside Halong Bay. 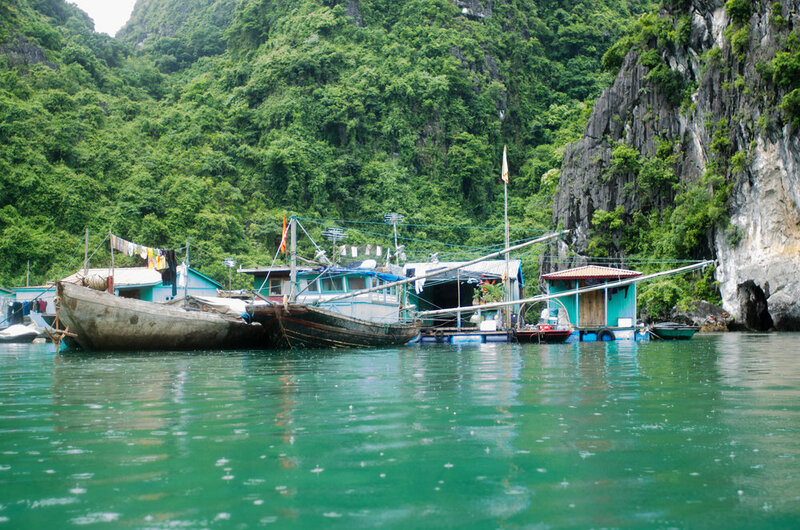 Houses float together surrounded by water, not grass and fisherman boats are tethered to the wrap around decks with netted holes where the catch of the day swim in circles waiting to go to the market. I have to assume that the fishermen detest the big tour boats that pass through the Bay each day. If I remember correctly, our guide said there are around 400 boats operating on a daily basis in the Bay. One of the highlights of the trip, aside from the beauty of the Bay of course, is the jumping off the boat that inevitably occurs. There’s something magical about lining up on the edge of the roof of a two or three story boat with friends you’ve just made that day and throwing yourself into the water below at the count of three. Don’t let these pictures fool you, Cristina and I jumped with all of the boys anxiously lined up. Unfortunately, the water wasn’t as clean as it was 4 years ago and after our first jump, quite a bit of debris (and oil or gasoline spots?) floated by. Hopefully some green initiatives will take place soon, or I hate to see what the Bay will look like in another four years if the tourism industry continues to expand. 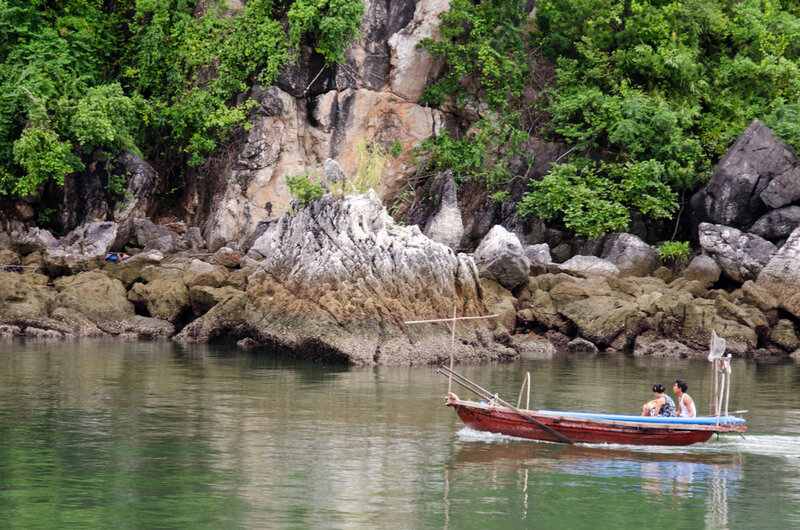 When booking a boat for the bay, there are generally two options: the cheapest boat and the slightly more expensive boat. Backpackers encourage each other to go ahead and pay the extra ($10-$20) for the better boat. I have nothing to compare to, but apparently the cheap boats are really… CHEAP. So when we booked, we thought we were simply going to be on the slightly more expensive boat, we were a little surprised when this option landed us on “The Party Boat.” Our glass of wine and fruit party on the roof was no Cabo Spring Break Party, but it was nice, and it did involve some karaoke- which we dominated, as warned to our new friends, that after 5 and 8 years in Korea we would be awesome. Here are some blurry photos of us in the dining room of the boat, just to give you an idea of what it looked like. A bit worn out still from the move out of Seoul, the day in Kuala Lumpur, and the night spent in the airport, we both welcomed the rain and the excuse to relax in and around the Hanoi Backpackers Hostel. We planned and booked trips to Halong Bay and Sapa, chatted with fellow backpackers, wandered out for lunch, only to come back in to camp out on our computers for a bit, and then wandered back out for some banh mi sandwiches made in a makeshift “kitchen” consisting of a portable burner and a couple of portable cabinets. We sat on stools an average American would deem fit for a three year old and ate our sandwiches before we schlepped back to bed. We got into Hanoi around 8:30 in the morning. Exhausted was an understatement. Luckily Andrew was more coherent than I was and led me away from the airport information desk trying to scam us into an expensive ($20.00) taxi into the city. Instead, we headed towards the Vietnam Airlines shuttle into the city center for $2.00 each, and walked to Hanoi Backpackers Hostel. Anxious for a bed, we splurged (a whole $5.00) for our own room and promptly passed out. When we woke up to darkness, we ventured out for some pho and walked around until we got lost in Hanoi, the first time of many.